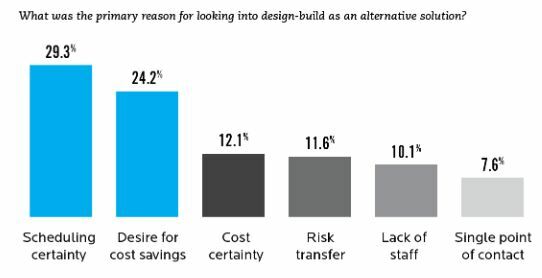 While there are clear benefits outlined in the survey, the report also confirmed research data from the Water Design-Build Council (WDBC), indicating two of the single largest elements that raise owners' concerns when considering DB delivery: Loss of control and life cycle challenges. WDBC's educational materials and programs confront these topics and provide further insight to resolving their concerns. Produced from WDBC’s research data, these education programs provide additional focus on loss of control and life cycle concerns, which are resolved through the recommended best practices and options embedded in the flexibility of collaborative delivery. Subsequently, control and life cycle are no longer concerns, but rather become assets to an owner's successful delivery of their vital water and wastewater infrastructure. Please click here for more information about Black & Veatch's 2015 Strategic Directions Report. For more information about the Water Design Build Council's education series, and to learn more about how collaborative delivery can benefit your water or wastewater agency or utility, please see our website.